For other 737 variants, see Boeing 737, Boeing 737 Classic, and Boeing 737 Next Generation. This 737 series was publicly announced on August 30, 2011. The first 737 MAX airplane, named The Spirit of Renton, performed its first flight on January 29, 2016. The 737 MAX series gained FAA certification on March 8, 2017. The first delivery was a MAX 8 on May 6, 2017, to Malindo Air, which placed the aircraft into service on May 22, 2017. The 737 MAX is based on earlier 737 designs. It is re-engined with more efficient CFM International LEAP-1B engines, aerodynamic improvements (including distinctive split-tip winglets), and airframe modifications. The 737 MAX series has been offered in four variants, typically offering 138 to 230 seats and a 3,215 to 3,825 nmi (5,954 to 7,084 km) range. The 737 MAX 7, MAX 8, and MAX 9 are intended to replace the 737-700, -800, and -900, respectively. Additional length is offered with the further stretched 737 MAX 10. As of January 2019[update], the Boeing 737 MAX has received 5,011 firm orders and delivered 350 aircraft. After two fatal crashes of MAX 8 aircraft in October 2018 and March 2019, regulatory authorities around the world grounded the aircraft series indefinitely. On March 19, 2019, the U.S. Department of Transportation requested an audit of the regulatory process that led to the aircraft's certification in 2017. In 2006, Boeing started considering the replacement of the 737 with a "clean-sheet" design that could follow the Boeing 787 Dreamliner. In June 2010, a decision on this replacement was postponed into 2011. On December 1, 2010, Boeing's competitor, Airbus, launched the Airbus A320neo family to improve fuel burn and operating efficiency with new engines: the CFM International LEAP and Pratt & Whitney PW1000G. In February 2011, Boeing's CEO Jim McNerney maintained "We're going to do a new airplane." At the March 2011 ISTAT conference, BCA President James Albaugh was not sure about a 737 re-engine, like Boeing CFO James A. Bell stated at the JP Morgan Aviation, Transportation and Defense conference the same month. The A320neo gathered 667 commitments at the June 2011 Paris Air Show for a backlog of 1,029 units since its launch, setting an order record for a new commercial airliner. On July 20, 2011, American Airlines announced an order for 460 narrowbody jets including 130 A320ceos and 130 A320neos, and intended to order 100 re-engined 737s with CFM LEAPs, pending Boeing confirmation. The order broke Boeing's monopoly with the airline and forced Boeing into a re-engined 737. As this sale included a Most-Favoured-Customer Clause, Airbus has to refund any difference to American if it sells to another airline at a lower price, so the European manufacturer can not give a competitive price to competitor United Airlines, leaving it to a Boeing-skewed fleet. On August 30, 2011, Boeing's board of directors approved the launch of the re-engined 737, expecting a fuel burn 4% lower than the A320neo. Studies for additional drag reduction were performed during 2011, including revised tail cone, natural laminar flow nacelle, and hybrid laminar flow vertical stabilizer. Boeing abandoned the development of a new design. Boeing expected the 737 MAX to meet or exceed the range of the Airbus A320neo. Firm configuration for the 737 MAX was scheduled for 2013. In March 2010, the estimated cost to re-engine the 737 according to Mike Bair, Boeing Commercial Airplanes' vice president of business strategy & marketing, would be $2–3 billion including the CFM engine development. During Boeing's Q2 2011 earnings call, former CFO James Bell said the development cost for the airframe only would be 10–15% of the cost of a new program estimated at $10–12 billion at the time. Bernstein Research predicted in January 2012 that this cost would be twice that of the Airbus A320neo. Fuel consumption is reduced by 14% from the 737NG. In November 2014, Boeing Chief Executive Officer Jim McNerney said the 737 will be replaced by a new airplane by 2030, slightly bigger and with new engines but keeping its general configuration, probably a composite airplane. On August 13, 2015, the first 737 MAX fuselage completed assembly at Spirit Aerosystems in Wichita, Kansas, for a test aircraft that would eventually be delivered to launch customer Southwest Airlines. On December 8, 2015, the first 737 MAX—a MAX 8 named Spirit of Renton—was rolled out at the Boeing Renton Factory. Because GKN could not produce the titanium honeycomb inner walls for the thrust reversers quickly enough, Boeing switched to a composite part produced by Spirit to deliver 47 MAXs per month in 2017. Spirit supplies 69% of the 737 airframe, including the fuselage, thrust reverser, engine pylons, nacelles, and wing leading edges. A new spar-assembly line with robotic drilling machines should increase throughput by 33%. The Electroimpact automated panel assembly line sped up the wing lower-skin assembly by 35%. Boeing planned to increase its 737 MAX monthly production rate from 42 planes in 2017 to 57 planes by 2019. The rate increase strained the production and by August 2018, over 40 unfinished jets were parked in Renton, awaiting parts or engine installation, as CFM engines and Spirit fuselages were delivered late. After parked airplanes peaked at 53 at the beginning of September, Boeing reduced this by nine the following month, as deliveries rose to 61 from 29 in July and 48 in August. In collaboration with Commercial Aircraft Corporation of China Ltd., Boeing has built a completion and delivery facility for the 737 MAX in Zhoushan, China. This facility initially handles interior finishing only, but will subsequently be expanded to include paintwork. The first aircraft was delivered from the facility to Air China on December 15, 2018. From mid-April 2019, the company announced it was temporarily cutting production of the 737 aircraft from 52 per month to 42 amid the Boeing 737 MAX groundings. Production of the LEAP-1B engine will continue at an unchanged rate, enabling CFM to catch up its backlog within a few weeks. The first flight took place on January 29, 2016, at Renton Municipal Airport—nearly 49 years after the maiden flight of the 737, a 737-100, on April 9, 1967. The first MAX 8, 1A001, was used for aerodynamic trials: flutter testing, stability and control, and takeoff performance-data verification, before it was modified for an operator and delivered. 1A002 was used for performance and engine testing: climb and landing performance, crosswind, noise, cold weather, high altitude, fuel burn and water-ingestion. Aircraft systems including autoland were tested with 1A003. 1A004, with an airliner layout, flew function-and-reliability certification for 300h with a light flight-test instrumentation. The 737 MAX gained FAA certification on March 8, 2017. It was approved by the EASA on March 27, 2017. After completing 2,000 test flight hours and 180-minute ETOPS testing requiring 3,000 simulated flight cycles in April 2017, CFM International notified Boeing of a possible manufacturing quality issue with low pressure turbine (LPT) discs in LEAP-1B engines. Boeing suspended 737 MAX flights on May 4, and resumed flights on May 12. During the certification process, the FAA delegated many evaluations to Boeing, allowing the manufacturer to review their own product. It was widely reported that Boeing pushed to expedite approval of the 737 MAX to compete with the Airbus A320neo. That aircraft hit the market nine months ahead of Boeing's model. The first delivery was a MAX 8, handed over to Malindo Air (a subsidiary of Lion Air) on May 16, 2017; it entered service on May 22. Norwegian Air subsidiary Norwegian Air International was the second airline to put a 737 MAX into service, when it performed its first transatlantic flight with a MAX 8 named Sir Freddie Laker on July 15, 2017 between Edinburgh Airport in Scotland and Bradley International Airport in the US state of Connecticut, followed by a second rotation from Edinburgh to Stewart Airport, New York. Boeing aims to match the 99.7% dispatch reliability of the 737 Next Generation (NG). Southwest Airlines, the launch customer, took delivery of its first 737 MAX on August 29, 2017. Boeing planned to deliver at least 50 to 75 aircraft in 2017, 10–15% of the more than 500 737s to be delivered in the year. After one year of service, 130 MAXs had been delivered to 28 customers, logging over 41,000 flights in 118,000 hours and flying over 6.5 million passengers. flydubai observed 15% more efficiency than the NG, more than the 14% promised, and dependability reached 99.4%. Long routes include 24 over 2,500 nmi (4,630 km), including a daily Aerolineas Argentinas service from Buenos Aires to Punta Cana over 3,252 nmi (6,023 km). On March 11, 2019, in response to the Lion Air and Ethiopian Airlines accidents (see § Accidents and incidents, below), China ordered the grounding of all 737 MAX aircraft operated by its airlines. Boeing CEO Dennis Muilenburg called U.S. President Trump at this time assuring him of the safety of the MAX planes. Over the next two days, the Federal Aviation Administration (FAA) resisted calls to ground the aircraft. These were made by members of the United States Congress, including both Republicans and Democrats, such as Ted Cruz and Diane Feinstein, former United States Secretary of Transportation Ray LaHood, unions, such as the Association of Flight Attendants and Association of Professional Flight Attendants, and other groups. The FAA claimed that there was insufficient evidence to support this, while individual airlines and government authorities around the world suspended operation of the aircraft, in contrast to the usual coordinated approach. Two days later, having initially resisted requests, the FAA grounded the aircraft in the U.S. as the last aviation regulator to take action. Boeing, after resisting initial requests, then changed its mind and recommended the grounding to the FAA. 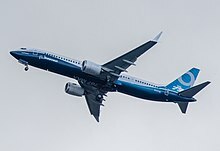 On March 14, 2019, Boeing suspended deliveries of new aircraft, but continued production. European and Canadian regulators will conduct their own safety assessments independently of the FAA before lifting the grounding order. The 737 MAX's Maneuvering Characteristics Augmentation System (MCAS) was implicated in the Lion Air accident and came under suspicion due to apparent similarities in the Ethiopian Airlines crash. Experts suggested that pilot training on the MCAS was insufficient. The day after the Ethiopian Airlines crash, a subpoena was issued by a US grand jury. On March 19, 2019, the US Department of Transportation requested the Office of Inspector General to conduct an audit on the 737 MAX certification process and Congress also announced an investigation into the same process. The FBI has also joined the criminal investigation into the certification. Concerns have also been expressed in relation to FAA rules that allowed Boeing to extensively "self-certify" aircraft. In mid-2011, the objective was to match the A320neo's 15% fuel burn advantage, but the initial reduction was 10–12%; it was later enhanced to 14.5%: the fan was widened from 61 inches to 69.4 inches by raising the nose gear and placing the engine higher and forward, the split winglet added 1–1.5%, a relofted tail cone 1% more and electronically controlling the bleed air system improves efficiency. The split tip wingtip device is designed to maximize lift while staying in the same ICAO Aerodrome Reference Code letter C gates as current 737s. It traces its design to the McDonnell Douglas MD-12 1990s twin-deck concept, proposed for similar gate restrictions before the Boeing merger. A MAX 8 with 162 passengers on a 3,000 nmi (5,600 km) mission will have up to a 1.8% better fuel burn than a blended-winglet-equipped aircraft and 1% over 500 nmi (930 km) at Mach 0.79. The new winglet is 9 ft 6 in (2.90 m) high. Other improvements include a re-contoured tail cone, revised auxiliary power unit inlet and exhaust, aft-body vortex generators removal and other small aerodynamic improvements. Aviation Partners offers a similar "Split-Tip Scimitar" winglet for previous 737NGs. It resembles a three-way hybrid between a blended winglet, wingtip fence, and raked wingtip. The 8 in (20 cm) taller nose-gear strut keeps the same 17-inch (43 cm) ground clearance of the engine nacelles. New struts and nacelles for the heavier engines add bulk, the main landing gear and supporting structure are beefier, and fuselage skins are thicker in some places for a 6,500 lb (2,900 kg) increase to the MAX 8's empty aircraft weight. To preserve fuel and payload capacity, its maximum takeoff weight is 7,000 lb (3,200 kg) heavier. Rockwell Collins will supply four 15.1-inch (380 mm) landscape liquid crystal displays (LCD), as used on the 787 Dreamliner, to improve pilots' situation awareness and efficiency. Boeing plans no major modifications for the 737 MAX flight deck, as it wants to maintain commonality with the 737 Next Generation family. Boeing Commercial Airplanes CEO Jim Albaugh said in 2011 that adding more fly-by-wire control systems would be "very minimal". Most of the systems are carried from the 737NG for a short differences-training course to upgrade flight crews. The 737 MAX extended spoilers are fly-by-wire controlled. As production standard, the 737 MAX will feature the Boeing Sky Interior with overhead bins and LED lighting based on the Boeing 787's interior. In 2011, the Leap-1B was initially 10–12% more efficient than the previous 156 cm (61 in) CFM56-7B of the 737NG. The 18-blade, woven carbon-fiber fan enables a 9:1 bypass ratio (up from 5.1:1 with the previous 24-blade titanium fan) for a 40% smaller noise footprint. The CFM56 bypass ranges from 5.1:1 to 5.5:1. The two-shaft design has a low-pressure section comprising the fan and three booster stages driven by five axial turbine stages and a high-pressure section with a 10-stage axial compressor driven by a two-stage turbine. The 41:1 overall pressure ratio, increased from 28:1, and advanced hot-section materials enabling higher operating temperatures permit a 15% reduction in thrust specific fuel consumption (TSFC) along with 20% lower carbon emissions, 50% lower nitrogen-oxide emissions, though each engine weighs 849 lb (385 kg) more at 6,129 lb (2,780 kg). In August 2011, Boeing had to choose between 66 in (168 cm) or 68 in (173 cm) fan diameters necessitating few landing gear changes to maintain a 17-inch (43 cm) ground clearance beneath the new engines; Boeing Commercial Airplanes chief executive officer Jim Albaugh stated "with a bigger fan you get more efficiency because of the bypass ratio [but also] more weight and more drag", with more airframe changes. The smaller Leap-1B engine will weigh less and have a lower frontal area but a lower bypass ratio leading to a higher thrust specific fuel consumption than the 78 in (200 cm) Leap-1A of the A320neo. In November 2011, Boeing selected the larger fan diameter, necessitating a 6–8 in (150–200 mm) longer nose landing gear. In May 2012, Boeing further enlarged the fan to 69.4 in (176 cm), paired with a smaller engine core within minor design changes before the mid-2013 final configuration. The nacelle features chevrons for noise reduction like the 787. A new bleed air digital regulator will improve its reliability. The new nacelles being larger and more forward possess aerodynamic properties which act to further increase the pitch rate. The larger engine is cantilevered ahead of and slightly above the wing, and the laminar flow engine nacelle lipskin is a GKN Aerospace one-piece, spun-formed aluminum sheet inspired by the 787. To mitigate the pitch-up tendency of the new flight geometry due to the heavier engines being located further forward and higher than previous engines, Boeing added the new Maneuvering Characteristics Augmentation System. The Maneuvering Characteristics Augmentation System (MCAS) was deployed on the 737 MAX to mitigate its tendency to pitch skywards due to the aircraft's engines being mounted further forward and upwards compared to previous models. The MCAS uses airspeed, altitude and angle of attack (AOA) sensor data to make an attempt at computing when a dangerous condition has developed and then trims the aircraft nose down. On March 28, Boeing had initially announced that the MCAS software modifications were completed and that the certification requirements for pilots would be revised, subject to approval by the FAA and regulators in other countries. In response, Canada, China, and the European Union have all stated that they will conduct independent evaluations before recertifying the aircraft. On April 1, Boeing announced further delays to the software update as additional work is needed. A critic[a] suggested that software changes may not be enough to counter the 737 MAX's engine placement. Questions remain as to why the angle of attack (AOA) sensor sent bad data that triggered the MCAS system to trim a nose down condition. Possible design or maintenance issues with the AOA sensors may have to be investigated. The 737-700, -800 and -900ER, the most widespread versions of the previous 737NG, are replaced by the 737 MAX 7, MAX 8 and MAX 9, respectively (FAA type certificate: 737-7, -8, and -9). The 737 MAX 8 entered service in May 2017, and the MAX 9 entered service in March 2018. The MAX 7 and MAX 200 are expected to enter service in 2019, and the MAX 10 in 2020. 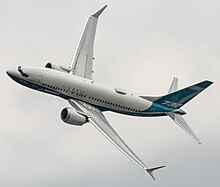 Boeing forecasts that 60–65% of demand for the airliner will be for the 737 MAX 8 variant, 20–25% for the MAX 9 and MAX 10, and 10% for the MAX 7. Originally based on the 737-700, Boeing announced the redesign of the MAX 7 derived from the MAX 8 at the July 2016 Farnborough Air Show, accommodating two more seat rows than the 737-700 for 138 seats, up 12 seats. The redesign uses the 737-8 wing and landing gear; a pair of overwing exits rather than the single-door configuration; a 46-inch longer aft fuselage and a 30-inch longer forward fuselage; structural re-gauging and strengthening; and systems and interior modifications to accommodate the longer length. It is to fly 1,000 nmi (1,900 km) farther than the -700 with 18% lower fuel costs per seat. Boeing predicts the MAX 7 to carry 12 more passengers 400 nmi (740 km) farther than A319neo with 7% lower operating costs per seat. Boeing plans to improve its range from 3,850 nmi (4,430 mi; 7,130 km) to 3,915 nmi (4,505 mi; 7,251 km) after 2021. Production on the first 65-foot-long (20 m) wing spar for the 737-7 began in October 2017. Assembly of the first flight-test aircraft began on November 22, 2017 and was rolled out of the factory on February 5, 2018. The MAX 7 took off for its first flight on March 16, 2018 from the factory in Renton, Washington and flew for three hours over Washington state. It reached 250 kn (460 km/h) and 25,000 ft (7,600 m), performed a low approach, systems checks and an inflight engine restart, and landed in Moses Lake, Washington, Boeing's flight test center. Entry into service with launch operator Southwest Airlines was expected in January 2019, but the airline deferred these orders until 2023-2024. Entry into service with WestJet is to follow delivery of five airplanes expected in 2019. Customers for the aircraft include Southwest Airlines (30), WestJet (23), Canada Jetlines (5) and ILFC Aviation (5). The MAX 7 seems to have fewer than 100 orders among over 4,300 MAX total sales. The Boeing 737 MAX 8 completed its first flight testing in La Paz, Bolivia. The 13,300-foot altitude at El Alto International Airport tested the MAX's capability to take off and land at high altitudes. Its first commercial flight was operated by Malindo Air on May 22, 2017 between Kuala Lumpur and Singapore as Flight OD803. In early 2017, a new -8 was valued at $52.85 million, rising to below $54.5 million by mid 2018. In September 2014, Boeing launched a high-density version of the 737 MAX 8, the 737 MAX 200, named for seating for up to 200 passengers in a single-class high-density configuration with slimline seats; an extra exit door is required because of the higher passenger capacity. Boeing states that this version will be 20% more cost efficient per seat than current 737 models, and will be the most efficient narrow-body on the market when delivered, including 5% lower operating costs than the 737 MAX 8. Three of eight galley trolleys are removed to accommodate more passenger space. An order with Ryanair for 100 aircraft was finalized in December 2014. In mid-November 2018, the first of the 135 ordered by Ryanair rolled out with an additional set of exit doors. It was first flown from Renton on January 13, 2019, and is due to enter service in April 2019. Ryanair expects to receive four further MAX 200s in 2019. Airlines have been shown a 737-8ERX concept based on the 737 MAX 8 with a higher 194,700 lb (88.3 t) maximum take-off weight using wings, landing gear and central section from the MAX 9 to provide a longer range of 4,000 nautical miles (4,600 mi; 7,400 km) with seating for 150, closer to the Airbus A321LR. The 737 MAX 9 will replace the 737-900 and has a longer fuselage than the MAX 8. Boeing plans to improve its range from 3,510 nmi (4,040 mi; 6,500 km) to 3,605 nmi (4,149 mi; 6,676 km) after 2021. Lion Air is the launch customer with an order for 201 in February 2012. It made its roll-out on March 7, 2017, and first flight on April 13, 2017; it took off from Renton Municipal Airport and landed at Boeing Field after a 2 hr 42 min flight. It was presented at the 2017 Paris Air Show. Boeing 737-9 flight tests were scheduled to run through 2017, with 30% of the -8 tests repeated; aircraft 1D001 was used for autoland, avionics, flutter, and mostly stability-and-control trials, while 1D002 was used for environment control system testing. It was certified by February 2018. Asian low-cost carrier Lion Air Group took delivery of the first on March 21, 2018 before entering service with Thai Lion Air. As the competing A321neo attracts more orders, the value of 737-9 is the same as a 2018 737-8 at $53 million. To compete with the Airbus A321neo, loyal customers such as Korean Air and United Airlines pressed Boeing to develop a larger variant than the MAX 9, of which Boeing revealed studies in early 2016. As the A321neo had outsold the MAX 9 five-to-one, the proposed MAX 10 included a larger engine, stronger wing, and telescoping landing gear in mid-2016. In September 2016, it was reported that the variant would be simpler and lower-risk with a modest stretch of 6–7 ft (1.83–2.13 m) for a length of 143–144 ft (43.6–43.9 m), seating 12–18 more passengers for 192-198 in a dual-class layout or 226-232 for a single class, needing an uprated 31,000 lbf (140 kN) CFM LEAP-1B that could be available by 2019 or 2020 and would likely require a landing-gear modification to move the rotation point slightly aft. In October 2016, Boeing's board of directors granted authority to offer the stretched variant with two extra fuselage sections forward and aft with a 3,100 nautical miles (3,600 mi; 5,700 km) range reduced from 3,300 nautical miles (3,800 mi; 6,100 km) of the -9. In early 2017, Boeing showed a 66 in (1.7 m) stretch to 143 feet (44 m), enabling seating for 230 in a single class or 189 in two-class capacity, compared to 193 in two-class seating for the A321neo. The modest stretch of the MAX 10 enables the aircraft to retain the existing wing and CFM Leap 1B engine from the MAX 9 with a trailing-link main landing gear as the only major change. Boeing 737 MAX Vice President and General Manager Keith Leverkuhn says the design has to be frozen in 2018 for a 2020 introduction. Boeing hopes that 737-900 operators and 737 MAX 9 customers like United Airlines, Delta Air Lines, Alaska Airlines, Air Canada, Lion Air, and Chinese airlines will be interested in the new variant. Boeing predicts a 5% lower trip cost and seat cost compared to the A321neo. Air Lease Corporation wants it a year sooner; its CEO John Pleuger stated "It would have been better to get the first airplane in March 2019, but I don't think that's possible". AerCap CEO Aengus Kelly is cautious and said the -9 and -10 "will cannibalize each other". The MAX 10 was launched on June 19, 2017, with 240 orders and commitments from more than ten customers. United Airlines will be the largest 737 MAX 10 customer, converting 100 of their 161 orders for the MAX 9 into orders for the MAX 10. Boeing ended the 2017 Paris Air Show with 361 orders and commitments, including 214 conversions, from 16 customers, including 50 orders from Lion Air. The variant configuration was firmed up by February 2018, and by mid-2018, the critical design review was completed. As of August 2018[update], assembly was underway with a first flight planned for late 2019. The semi-levered landing gear design has a telescoping oleo-pneumatic strut with a down-swinging lever to permit a 9.5 inches (24 cm) taller gear. Driven by the existing retraction system, a shrink-link mechanical linkage mechanism at the top of the leg, inspired by carrier aircraft designs, allows the gear to be drawn in and shortened while being retracted into existing wheel well. Entry into service is slated for July 2020. The BBJ MAX 8 and BBJ MAX 9 are proposed business jet variants of the Boeing 737 MAX 8 and 9 with new CFM LEAP-1B engines and advanced winglets providing 13% better fuel burn than the Boeing Business Jet; the BBJ MAX 8 will have a 6,325 nmi (11,710 km) range and the BBJ MAX 9 a 6,255 nmi (11,580 km) range. The BBJ MAX 7 was unveiled in October 2016 with a 7,000 nmi (12,960 km) range and 10% lower operating costs than the original BBJ while being larger. The MAX BBJ 8 first flew on April 16, 2018, before delivery later the same year, and will have a range of 6,640 nmi (12,300 km) with an auxiliary fuel tank. Initially, the customers for the 737 MAX were not disclosed, except for American Airlines. On November 17, 2011, Boeing released the names of two other customers—Lion Air and SMBC Aviation Capital. At that time, Boeing reported 700 commitments from 9 customers for the 737 MAX. On December 13, 2011, Southwest Airlines ordered 150 737 MAX aircraft with 150 options. By December 2011, Boeing had 948 commitments and firm orders from 13 customers for the 737 MAX. On September 8, 2014, Ryanair signed an agreement with Boeing to purchase up to 200 new Boeing 737 MAX 200 "gamechanger" aircraft—comprising 100 firm orders and 100 options. In January 2017, aircraft leasing company GECAS ordered 75 more 737 MAX 8 airliners. As of January 2019[update], Boeing had 5,011 firm orders from 78 identified customers for the 737 MAX. The top three identified airline customers for the 737 MAX are Southwest Airlines with 280 orders, flydubai with 251 orders, and Lion Air with 251 orders. The first new series aircraft, a MAX 8, was delivered to Malindo Air on May 16, 2017. On October 29, 2018, Lion Air Flight 610, 737 MAX 8 registration PK-LQP, plunged into the Java Sea 13 minutes after take off from Soekarno–Hatta International Airport, Jakarta, Indonesia. The flight was a scheduled domestic flight to Depati Amir Airport, Pangkal Pinang, Indonesia. All 189 on board died. This was the first fatal aviation accident and first hull loss of a 737 MAX. The aircraft had been delivered to Lion Air two months earlier. People familiar with the investigation reported that during a flight piloted by a different crew on the day before the crash, the same aircraft experienced a similar malfunction but an extra pilot sitting in the cockpit jumpseat correctly diagnosed the problem and told the crew how to disable the flight-control system. Following the Lion Air crash, Boeing issued an operational manual guidance, advising airlines on how to address erroneous cockpit readings. The accident is under investigation, with the final report expected to be released between August and September 2019. On March 10, 2019, Ethiopian Airlines Flight 302, 737 MAX 8 registration ET-AVJ, crashed approximately six minutes after takeoff from Addis Ababa, Ethiopia, on a scheduled flight to Nairobi, Kenya, killing all 149 passengers and 8 crew members on board. The aircraft was four months old at the time. The cause of the crash is unclear as of March 19, 2019[update], though the aircraft's vertical speed after takeoff was reported to be unstable. Evidence retrieved on the crash site suggests that, at the time of the crash, the aircraft was configured to dive, similar to Lion Air Flight 610. According to Ethiopian transport minister Dagmawit Moges, the crew "performed all the procedures repeatedly provided by the manufacturer but was not able to control the aircraft". ^ a b c "Boeing's 737 MAX takes wing with new engines, high hopes". The Seattle Times. January 29, 2016. ^ a b c d e Hashim, Firdaus (May 22, 2017). "Malindo operates world's first 737 Max flight". Flight Dashboard. FlightGlobal. ^ a b c Austen, Ian; Gebrekidan, Selam (March 13, 2019). "Trump Announces Ban of Boeing 737 Max Flights". The New York Times. Retrieved 2019-03-13. ^ "Production begins on first 737 MAX parts". Boeing Commercial Airplanes. October 13, 2014. ^ a b "Boeing Commercial Airplanes – Orders and Deliveries – 737 Model Summary". boeing.com. Boeing. October 2018. Retrieved November 21, 2018. ^ a b Hamilton, Scott (January 27, 2012). "Boeing disputes 737 Max development cost report". Air Transport Intelligence News. FlightGlobal. ^ a b "Boeing Launches 737 New Engine Family with Commitments for 496 Airplanes from Five Airlines" (Press release). Boeing. August 30, 2011. ^ a b c d e f "Type Certificate Data Sheet No. A16WE" (PDF). FAA. March 8, 2017. ^ a b c "Boeing 737 MAX 8 Earns FAA Certification". boeing.mediaroom.com. PRNewswire: Boeing Communications. 9 March 2017. ^ a b c d Trimble, Stephen (May 16, 2017). "Boeing delivers first 737 Max". Flight Dashboard. FlightGlobal. ^ a b c d e f "Boeing 737: Orders and Deliveries (updated monthly)". The Boeing Company. February 28, 2019. Retrieved March 16, 2019. ^ "Boeing: US orders review of 737 Max licence to fly". 2019-03-19. Retrieved 20 March 2019. ^ Chao, Elaine. "Memorandum from the Secretary" (PDF). U.S. Department of Transportation. Retrieved 20 March 2019. ^ "Boeing firms up 737 replacement studies by appointing team". Flight International. FlightGlobal. March 3, 2006. ^ Hamilton, Scott (June 24, 2010). "737 decision may slip to 2011: Credit Suisse". Flight International. FlightGlobal. ^ "Airbus offers new fuel saving engine options for A320 Family". Airbus (Press release). December 1, 2010. ^ Freed, Joshua (February 10, 2011). "Boeing CEO: 'new airplane' to replace 737". NBC News. Associated Press. ^ "Most airlines taking cautious approach to next gen aircraft". CAPA Centre for Aviation. April 11, 2011. ^ "Airbus with new order record at Paris Air Show 2011". Airbus (Press release). June 23, 2011. ^ "AMR Corporation Announces Largest Aircraft Order in History With Boeing and Airbus". American Airlines (Press release). July 20, 2011. ^ Clark, Nicola (July 20, 2011). "Jet Order by American is a Coup for Boeing's Rival". The New York Times. Retrieved March 12, 2019. ^ Russell, Edward (October 4, 2017). "United goes airframer 'agnostic' on future orders". Flight Dashboard. FlightGlobal. ^ Ostrower, Jon (August 30, 2011). "More details emerge on configuration of re-engined 737". Flight International. FlightGlobal. Retrieved September 5, 2011. ^ O'Keeffe, Niall (September 12, 2011). "Caution welcomed: Boeing's 737 Max". Flight International. ^ Ostrower, Jon (February 19, 2012). "Boeing says 737 Max to meet or exceed A320neo range". Air Transport Intelligence News. FlightGlobal. ^ Ostrower, Jon (November 7, 2011). "Boeing completes initial review of 737 Max configuration". Air Transport Intelligence News. FlightGlobal. ^ a b c d e f g h i j George, Fred (May 12, 2017). "Pilot Report: Flying the 737-8, Boeing's New Narrowbody Breadwinner". Aviation Week & Space Technology. ^ Carvalho, Stanley (November 5, 2014). "Boeing plans to develop new airplane to replace 737 MAX by 2030". Reuters. ^ Siebenmark, Jerry (August 13, 2015). "Spirit AeroSystems completes first Boeing 737 Max fuselage". Wichita Eagle. ^ Gates, Dominic (December 8, 2015). "Boeing unveils the first 737 MAX and its new production line". The Seattle Times. ^ DeMay, Daniel (December 8, 2015). "Photos: Boeing rolls out new 737 MAX 8 airplane". Seattle Post-Intelligencer. ^ Trimble, Stephen (December 1, 2016). "First redesigned thrust reverser delivered for 737 Max". Flight Dashboard. FlightGlobal. ^ a b c d e Norris, Guy (February 15, 2017). "In Pictures: First Boeing 737-9 Noses Toward Rollout". Aviation Week & Space Technology. ^ Trimble, Stephen (April 10, 2017). "Boeing prepares for unprecedented 737 Max ramp-up". Flight Dashboard. FlightGlobal. ^ Gates, Dominic (August 2, 2018). "Boeing's 737 ramp-up slows as unfinished planes pile up in Renton". The Seattle Times. ^ Gates, Dominic (October 9, 2018). "Boeing finally begins to reduce its 737 delivery backlog Originally". The Seattle Times. ^ "Boeing Hosts China President Xi Jinping, Announces Airplane Sales, Expanded Collaboration with China's Aviation Industry" (Press release). Boeing. ^ "Pictures: Boeing delivers first China-completed 737 Max". FlightGlobal. December 15, 2018. Retrieved December 17, 2018. ^ Bruno, Michael; Dubois, Thierry (April 11, 2019). "Leap-1B Eyes Catch Up as 737 Production Slows". MRO Network. ^ Gates, Dominic (17 March 2019). "Flawed analysis, failed oversight: How Boeing, FAA certified the suspect 737 MAX flight control system". The Seattle Times. Retrieved 18 March 2019. ^ a b Goold, Ian (November 8, 2017). "Boeing Forges Ahead with Flight-test Campaigns". AIN. ^ "Type Certificate Data Sheet No. : IM.A.120" (PDF). EASA. March 27, 2017. ^ Karp, Aaron (May 10, 2017). "Boeing suspends 737 MAX flights, cites 'potential' CFM LEAP-1B issue". Air Transport World. Aviation Week Network. ^ Trimble, Stephen (May 12, 2017). "Boeing resumes 737 Max 8 test flights". Flight Dashboard. FlightGlobal. ^ a b Gates, Dominic (2019-03-17). "Flawed analysis, failed oversight: How Boeing and FAA certified the suspect 737 MAX flight control system". The Seattle Times. Retrieved 2019-03-17. ^ Robison, Peter; Levin, Alan (18 March 2019). "Boeing Drops as Role in Vetting Its Own Jets Comes Under Fire". Fortune. Bloomberg. Retrieved 18 March 2019. ^ Stieb, Matt (March 17, 2019). "Report: The Regulatory Failures of the Boeing 737 MAX". New York. Retrieved 2019-03-21. ^ Moores, Victoria (July 18, 2017). "Norwegian performs first transatlantic 737 MAX flight". Aviation Week Network. Penton. Retrieved July 19, 2017. ^ Waldron, Greg (April 13, 2017). "Boeing optimistic for early 737 Max dispatch reliability". Flight Dashboard. FlightGlobal. ^ Mary Schlangenstein and Julie Johnsson (August 30, 2017). "Southwest Quietly Takes Delivery of Its First Boeing 737 Max". Bloomberg. ^ Tinseth, Randy (May 22, 2018). "737 MAX: a year of serving the globe". Boeing. ^ "China's ban on the Boeing 737 Max inspires others, ramps up pressure on U.S. regulator". The Washington Post. March 12, 2019. ^ "China taking lead to ground Boeing 737 MAX 8 signals challenge to US authority in worldwide civil aviation". South China Morning Post. March 13, 2019. ^ Wolfe, Kathryn a. "Boeing CEO assures Trump that 737 MAX is safe". POLITICO. ^ "Ground the Boeing 737 Max 8, members of Congress implore the FAA after deadly crash". USA TODAY. ^ Stewart, Emily (March 12, 2019). "The Boeing 737 Max 8 crashes and controversy, explained". Vox. ^ "FAA won't ground Boeing 737 MAX, resisting calls by overseas regulators, aviation experts". The Seattle Times. March 12, 2019. ^ "Boeing: UK joins countries blocking aircraft". BBC News. March 12, 2019. Retrieved March 12, 2019. ^ King, Charlotte (March 12, 2019). "Which airlines operate Boeing 737 Max jets?". The Guardian. Retrieved March 12, 2019. ^ "Opinion: Confidence threatened by polarised Max response". Flight International. FlightGlobal. March 13, 2019. ^ Hemmerdinger, Jon (March 13, 2019). "US orders Boeing 737 Max grounded". Flight Dashboard. FlightGlobal. Retrieved 2019-03-14. ^ Hemmerdinger, Jon (March 14, 2019). "Boeing stops 737 Max deliveries in wake of grounding". Flight Dashboard. FlightGlobal. ^ "Response to Max crashes will define Boeing's reputation". Flight International. FlightGlobal. March 22, 2019. ^ Hemmerdinger, Jon (November 7, 2018). "FAA issues emergency 737 Max airworthiness order". Flight Dashboard. FlightGlobal. Retrieved March 10, 2019. ^ Gregg, Aaron; Siddiqui, Faiz. "Ethiopian Airlines crash is the second fatal incident to involve a Boeing 737 MAX 8". The Washington Post. Retrieved March 10, 2019. ^ Gallagher, Sean (March 11, 2019). "Another 737 MAX jet crash prompts groundings by China, Indonesia, Ethiopia". Ars Technica. ^ Gates, Dominic (November 12, 2018). "U.S. pilots flying 737 MAX weren't told about new automatic systems change linked to Lion Air crash". The Seattle Times. Retrieved March 14, 2019. ^ Gilbertson, Dawn. "Lion Air aftermath: Boeing meets with concerned American, Southwest pilots". USA Today. Retrieved March 14, 2019. ^ "Boeing nearing 737 Max fleet bulletin on AoA warning after Lion Air crash". The Air Current. November 7, 2018. Retrieved March 14, 2019. ^ "Audit of Certification for the Boeing 737 MAX 8" (PDF). U.S. Department of Transportation. March 19, 2019. Retrieved March 22, 2019. ^ "Congress To Investigate FAA Approval Of Boeing 737 Max Aircraft". CBS Chicago. March 18, 2019. ^ "FBI joining criminal investigation into certification of Boeing 737 MAX". The Seattle Times. 2019-03-20. Retrieved 2019-03-20. ^ "FBI joins criminal investigation into Boeing 737 MAX certification:..." Reuters. 2019-03-20. Retrieved 2019-03-20. ^ Van Cleave, Kris (19 March 2019). "Relationship between FAA and Boeing under scrutiny after deadly crash". cbsnews.com. CBS News. Retrieved March 28, 2019. ^ Kaplan, Thomas (March 26, 2019). 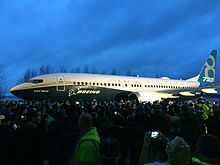 "After Boeing Crashes, Sharp Questions About Industry Regulating Itself" – via NYTimes.com. ^ Trimble, Stephen (June 15, 2017). "737 Max cutaway and technical description". FlightGlobal. ^ a b Norris, Guy (December 2, 2013). "Laminar Flow Boosts 737 MAX Long-Range Performance". Aviation Week & Space Technology. ^ Trimble, Stephen (August 10, 2012). "Aviation Partners, Boeing split opinions on 737 wing-tips". Air Transport Intelligence News. FlightGlobal. ^ Collins, Rockwell (November 15, 2012). "Rockwell Collins wins Boeing 737 MAX contract for large-format flight displays". ^ "Boeing aims to minimise 737 Max changes". Air Transport Intelligence News. FlightGlobal. August 31, 2011. ^ "Boeing Introduces 737 MAX With Launch of New Aircraft Family" (Press release). Boeing. August 30, 2011. ^ Ostrower, Jon (August 30, 2011). "More details emerge on configuration of re-engined 737". Flight International. FlightGlobal. 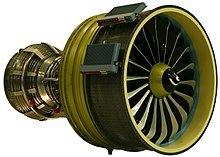 ^ "CFM56-7B". Safran. June 1, 2015. ^ Ostrower, Jon (August 31, 2011). "Boeing narrows 737 Max engine fan size options to two". FlightGlobal. ^ Ostrower, Jon (November 3, 2011). "Boeing reveals 737 Max configuration details". FlightGlobal. Retrieved March 26, 2019. ^ "Boeing cites 600 commitments for revamped 737". Reuters. November 3, 2011. ^ Ostrower, Jon (May 17, 2012). "Boeing Tweaks Engine for New 737 Max". The Wall Street Journal. ^ Polek, Gregory (November 13, 2011). "Boeing Takes Minimalist Approach to 737 MAX". Aviation International News. ^ Trimble, Stephen (July 23, 2013). "Boeing locks in 737 Max 8 configuration". FlightGlobal. Retrieved March 26, 2019. ^ "Boeing's safety analysis of 737 MAX flight control had crucial..." March 17, 2019 – via reuters.com. ^ Gregg, Aaron (April 4, 2019). "Boeing CEO apologizes for lives lost and acknowledges role of company's flight-control system in two crashes". Washington Post. Retrieved 4 April 2019. ^ Newburger, Emma (21 March 2019). "Crashed jets reportedly lacked key safety features because Boeing charged extra for them". CNBC. Retrieved 26 March 2019. ^ Tabuchi, Hiroko; Gelles, David (21 March 2019). "Doomed Boeing Jets Lacked 2 Safety Features That Company Sold Only as Extras". New York Times. Retrieved 26 March 2019. ^ a b "Boeing to upgrade 737 Max flight control software". Flight Dashboard. FlightGlobal. March 12, 2019. Retrieved March 12, 2019. ^ "Canadian and European Regulators to Certify Boeing 737 Max Changes in Addition to FAA". Fortune. ^ Ostrower, Jon (August 30, 2011). "Boeing designates 737 MAX family". Air Transport Intelligence News. FlightGlobal. Archived from the original on September 25, 2011. Retrieved August 31, 2011. ^ a b "Boeing Delivers First 737 MAX 9" (Press release). Boeing. March 21, 2018. ^ Mcgough, Michael (16 March 2018). "New Boeing 737 Max hits the skies. How its performance could impact flights to Hawaii". The Sacramento Bee. Retrieved 15 March 2019. ^ Calder, Simon (11 March 2019). "Which routes does the Boeing 737 MAX fly, and what are my options if I'm booked on one?". The Independent. Retrieved 15 March 2019. For British travellers, the most significant order is from Ryanair, which has 135 of a special version of the MAX 8 – the MAX 200, holding 197 passengers, eight more than the number of seats on its existing Boeing 737s. The first aircraft are due to enter service from Stansted on 14 May, on flights to Tenerife and Thessaloniki, with links to Athens, Corfu, Faro, Lisbon, Madrid, Malaga, Malta, Rhodes, Venice and many other locations. ^ a b c Trimble, Stephen (October 4, 2017). "Boeing starts building first 737 Max 7". Flight Dashboard. FlightGlobal. ^ Kingsley-Jones, Max (February 7, 2018). "Detailed design starts on 737 Max 10". Flight Dashboard. FlightGlobal. ^ "Farnborough: Boeing's Execution on 737 MAX Sparkles as MAX 7.5 and MAX 10X Loom". Airways Magazine. July 10, 2016. ^ "Boeing confirms 737 Max 7 redesign". Flight Dashboard. FlightGlobal. July 11, 2016. ^ "Boeing Upscales 737-700". Aviation International News. July 12, 2016. ^ a b Norris, Guy (March 16, 2018). "Boeing Begins 737-7 Flight Test Program". Aviation Week Network. ^ a b c "Boeing plans performance upgrade for 737 Max after 2021". Flight Dashboard. FlightGlobal. October 31, 2016. ^ Trimble, Stephen (November 23, 2017). "Boeing starts assembling first Max 7". Flight Dashboard. FlightGlobal. ^ Gates, Dominic (February 5, 2018). "Boeing debuts MAX 7 jet, smallest and slowest-selling of its 737 MAX family". The Seattle Times. Retrieved February 6, 2018. ^ "Boeing 737 Max 7 narrowbody jetliner makes maiden flight". Reuters. March 16, 2018. Retrieved 2018-03-16. ^ Trimble, Stephen (March 16, 2018). "Boeing launches 737 Max 7 into flight testing". Flight Dashboard. FlightGlobal. ^ Yeo, Ghim-Lay (January 2, 2018). "Southwest converts options for 40 more 737 Max 8s". Flight Dashboard. FlightGlobal. ^ "Q3 2017 MDA" (PDF). ^ "Boeing Completes 737 MAX 8 Firm Configuration". Boeing, July 23, 2013. ^ "737 MAX 8 performs first international flight". AeroLatin News. May 3, 2016. ^ "Boeing Launches 737 MAX 200 with Ryanair" (Press release). Boeing. September 8, 2014. ^ Gates, Dominic (September 8, 2014). "Ryanair makes big order for 737 MAX jets that can carry 200". The Seattle Times. ^ "Update 5-Ryanair buys 100 Boeing 737 MAX jets, sees fare price war". Reuters. September 8, 2014. ^ "Ryanair, Boeing Finalize Max 200 Deal". Aviation International News. December 1, 2014. ^ Norris, Guy (November 20, 2018). "Ryanair high density Boeing MAX emerges from factory". Aviation Week Network. ^ "First High-Capacity Boeing 737-8 Enters Flight Test Jan 23, 2019 Guy Norris". Aviation Week Network. ^ Clark, Oliver (February 14, 2019). "Ryanair Max to make debut at Stansted". Flight Dashboard. FlightGlobal. ^ "Boeing showing 737-8ERX concept in response to A321LR". Leeham News. March 12, 2015. ^ "Boeing's 737 MAX 9 takes off on first flight". The Seattle Times. April 13, 2017. ^ "Boeing completes 737 Max 9 maiden flight". Flight Dashboard. FlightGlobal. April 13, 2017. ^ "Civil Aviation Programs To Watch". Aviation Week & Space Technology. June 9, 2017. ^ Trimble, Stephen (February 16, 2018). "Boeing 737 Max 9 receives certification". Flight Dashboard. FlightGlobal. ^ Aircraft Value News (November 12, 2018). "B737-9 EASA Certification Does Nothing for Values". ^ a b c d Flottau, Jens (March 10, 2017). "Customers Press Boeing To Launch New Midsize Widebody Aircraft Soon". Aviation Week & Space Technology. ^ Trimble, Stephen (July 4, 2016). "Farnborough: Proposed stretch of 737 Max 9 possible, but challenging". Flight Dashboard. FlightGlobal. ^ Norris, Guy (September 30, 2016). "Simpler 737-10X, New Midsize Airplane Both 'Doable'". Aviation Week & Space Technology. ^ Norris, Guy (January 10, 2017). "Boeing Defines Final 737 MAX Stretch Offering". Aviation Week & Space Technology. ^ Ostrower, Jon (January 12, 2017). "Boeing chases airlines for stretch 737". CNN. ^ Tinseth, Randy (March 6, 2017). "MAX 10X". Boeing. ^ Johnsson, Julie (March 7, 2017). "Boeing's Longest 737 Max Can't Debut Too Soon for One Buyer". Bloomberg. ^ "Boeing Launches Larger Capacity 737 MAX 10 at 2017 Paris Air Show" (Press release). Boeing. June 19, 2017. ^ Trimble, Stephen (June 19, 2017). "Boeing launches 737 Max 10". Flight Dashboard. Flightglobal. ^ Dron, Alan (June 20, 2017). "United converts 100 MAX to -10 variant; CALC includes -10s in order". Aviation Week Network. ^ "Propelled by MAX 10, Boeing thumps Airbus at Paris Air Show". Leeham. June 22, 2017. ^ "Boeing, Lion Air Group Announce Commitment for 50 737 MAX 10s" (Press release). Boeing. June 19, 2017. ^ "Boeing 737 MAX 10 Reaches Firm Configuration" (Press release). Boeing. February 6, 2018. ^ Norris, Guy (August 30, 2018). "Boeing Unveils 737-10 Extended Main Landing Gear Design Details". Aviation Week & Space Technology. ^ Norris, Guy (February 9, 2018). "Boeing Completes Configuration For Final 737 MAX Derivative". Aviation Week & Space Technology. ^ "Airport Compatibility Brochure Boeing 737 MAX 10" (PDF). Boeing. Retrieved February 12, 2019. 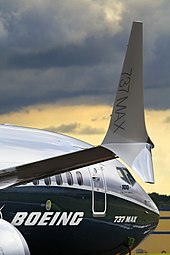 ^ "Boeing Business Jets to Offer the BBJ MAX" (Press release). Boeing. October 29, 2012. ^ "Boeing Business Jets Unveils BBJ MAX 7" (Press release). Boeing. October 31, 2016. ^ "Lion Air commits to up to 380 Boeing 737s". Air Transport Intelligence News. FlightGlobal. November 17, 2011. Retrieved November 17, 2011. ^ "Boeing 737 MAX Logs First Firm Order from Launch Customer Southwest Airlines" (Press release). Boeing. December 13, 2011. Retrieved December 26, 2011. ^ "737 Max commitments top 948". Air Transport Intelligence News. FlightGlobal. Retrieved December 15, 2011. ^ "Ryanair places $22bn order with Boeing, buys up to 200 new aircraft". Independent.ie. Retrieved April 1, 2015. ^ "Boeing, GECAS Announce Order for 75 737 MAXs" (Press release). Boeing. January 4, 2017. Retrieved January 4, 2017. ^ "Lion Air: How could a brand new plane crash?". BBC News. October 29, 2018. Retrieved March 14, 2019. ^ Indah Mutiara Kami (October 29, 2018). "Breaking News: Basarnas Pastikan Pesawat Lion Air JT 610 Jatuh". Detik.com. Retrieved October 30, 2018. ^ Alan Levin; Harry Suhartono (20 March 2019). "Pilot Who Hitched a Ride Saved Lion Air 737 Day Before Deadly Crash". Bloomberg. Retrieved 20 March 2019. ^ "Boeing issues operational manual guidance to airlines following Lion Air crash". CNN. November 7, 2018. Retrieved 2018-10-08. ^ "No public details on crashed Lion Air voice recorder until final report: Indonesian official". Reuters. January 22, 2019. Retrieved 2019-01-23. ^ "Ethiopian Airlines: 'No survivors' on crashed Boeing 737". BBC News. March 10, 2019. Retrieved 2019-03-10. ^ "Official pressrelease". ethiopianairlines.com. Retrieved 2019-03-10. ^ Hilsz-Lothian, Aaron (March 10, 2019). "Ethiopian Airlines Boeing 737 MAX involved in fatal crash". SamChui.com. Retrieved 2019-03-10. ^ "157 feared dead in Ethiopian plane crash". The Guardian. March 10, 2019. Retrieved 2019-03-10. ^ Lazo, Luz; Schemm, Paul; Aratani, Lori. "Investigators find 2nd piece of key evidence in crash of Boeing 737 Max 8 in Ethiopia". The Washington Post. Retrieved 16 March 2019. ^ "737 MAX Airplane Characteristics for Airport Planning" (PDF). Boeing. November 2018. ^ "Airport Compatibility Brochure 737 MAX 10" (PDF). Boeing. January 2019. ^ "Boeing 737 MAX by design". Boeing. ^ "LEAP Brochure" (PDF). CFM International. 2013. Archived from the original (PDF) on September 23, 2015. ^ "737MAX and the MD-12". Aviation Week. December 9, 2013. ^ a b "737 MAX". Boeing. Technical Specs. ^ "Boeing Revises "Obsolete" Performance Assumptions". Flight Dashboard. FlightGlobal. August 3, 2015. Wise, Jeff (March 11, 2019). "Where did Boeing go wrong?". Slate. "Countdown to Launch: The Boeing 737 MAX Timeline". Airways. January 27, 2016. Smith, Paul (May 12, 2017). "Flight test: Boeing's 737 Max – the same but different". FlightGlobal.